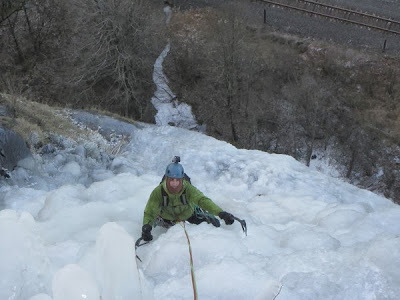 Ice climbing conditions on Sunday were pretty much as good as it gets in the Columbia River Gorge. We got to the Rooster Rock pullout at about 8:30 a.m. By the time we made it to the base of the route there were already two parties of two ahead of us. One additional party of three was also in line ahead of us and were discussing setting up a TR on the first pitch. Thankfully they talked themselves out of it and went elsewhere.